Hello - I am Paul Hartmann, 6'-11" tall, an architect, founder and owner of Tall Paul's. I know what it is like to live in a world where many things do not fit very well for tall people. We have a wide selection of very long beds for tall people as you can see at the right. 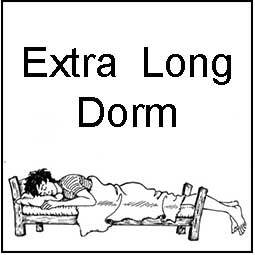 Our goal is to make very tall people comfortable in an extra long that is actually made for you. I have designed, adapted, selected, and more importantly tried, every item in the store. If you are tall, or love someone who is, this is the place for you. Looking for hard-to-find linen? We offer an extensive selection of bed linen in a wide variety of fabrics and sizes. Our linen is hand tailored for each order so you can be assured that the linen you order will fit your bed. Adjustable bed, extra long bed, antique bed, camper or boat - we can fit them all!